The tarot of the shadows is full of wisdom, advice and life lessons, which can help us remember and understand the experiences of life. Today, our oracle advises us what we learnt with our minds and what we feel in our hearts. 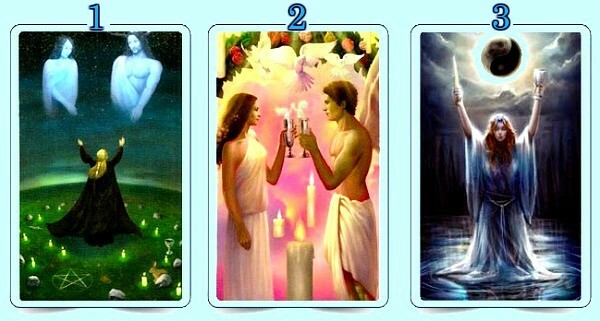 So all you have to do is choose the one card you like the most and read below to discover the meaning it brings for you. You probably understand perfectly at the intellectual level that your parents suffered as children, that their childhood was full of deprivation and poverty and that the love they gave you was the one they knew, but your heart still claims your parents were not enough loving or more understanding towards you. Tip: Close your eyes and silently ask your heart if you are really at peace with your childhood or there is still something that hurts. Healing is not in the mind, you must look for peace in your heart. Once you’ve found peace you can move on with your life and find true happiness. Maybe you don’t speak ill of that ex for which you suffered a lot, because on a mental level you understand what happened between you, but your heart is still sad and still crying for love and happiness. Tip: If your anger has cost you the opportunity to find a good partner, or because you had a bad time in your last relationship, you need to move on to the next chapter in your life without fear. Let your mind explain things rationally, and seek for a healing for your aching heart, so that the next relationship you have is filled with good love and happiness. You have undervalued yourself for the longest of times. You have tried so many things in your life, but your fear of failure has prevented you from ever achieving success in any of them and because of that now you are afraid to try new things again or look to meet new people in your life. Tip: Go down to your heart to heal that pain that still does not let you feel 100% happy with your life, with your image, with your goals, with what you have achieved. Do not feel afraid of feeling that pain, it is the only way to heal. Reach deep inside to find self-confidence and self-belief that you can achieve anything you set your mind to and everything you do will be successful. If you can achieve success with your mind, then your can do it with your physical body.